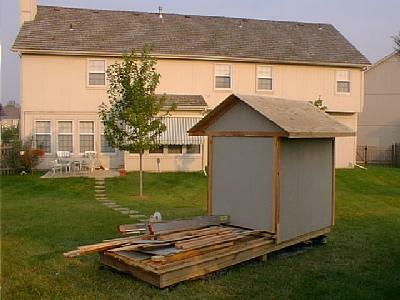 This page has been put together as a minute by minute chronical of the construction of the roll off building for Sunflower Observatory. 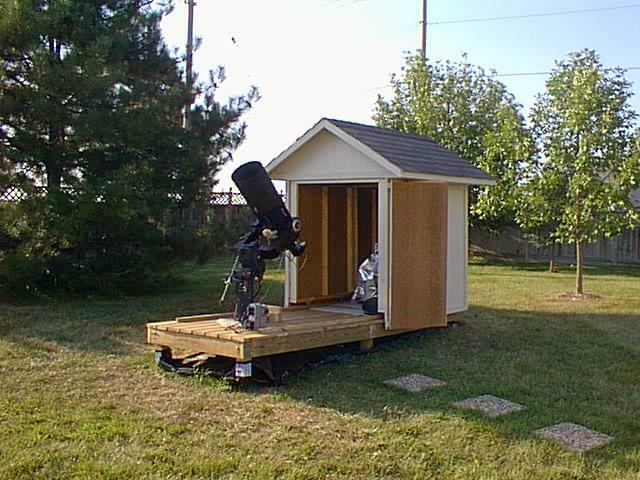 This back yard observatory houses a 25cm (that's 10 INCHES for you non-metric types) Meade LX200 automated telescope. It is equipped with motorized computer controls so it can be pointed to any location in the sky with great precision. It can even be controlled remotely. 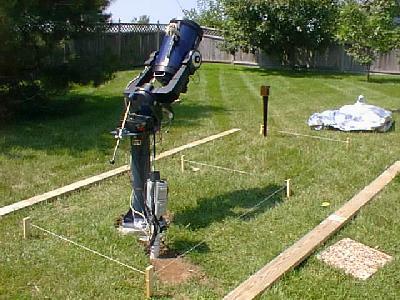 In this case the telescope is wired back to the house where it is connected to a computer. 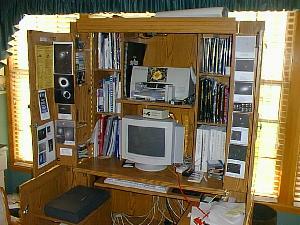 The operator runs the telescope from the relative comfort of the air conditioned control room inside the house. 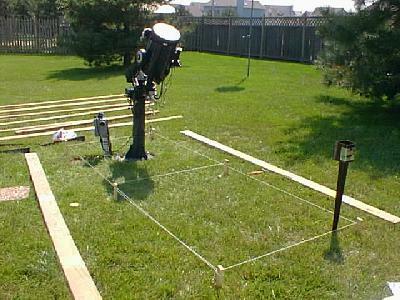 The telescope has a special camera hooked up to it which is controlled from a second computer inside the house. 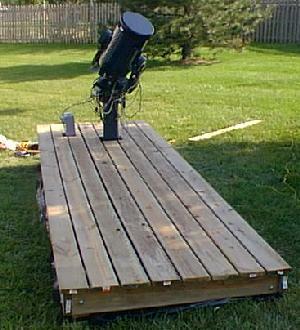 This is the way the telescope is used to observe. Images of the various objects are compared to a special program called The Sky and actual photographs called the Real Sky. In this way the exact locations of asteroids and other objects can be precisely plotted and reported to other interested observers. Rather than use concrete, I have chosen to use these drive in metal post holders for the corners. They are kind of expensive ($16ea.) but I figure the digging and concrete mixing would be a bigger hassle and almost as expensive. I did not hit rock when I dug for the pier so I figure this will work. We will see. 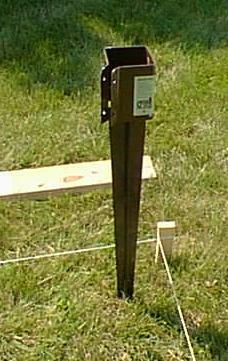 After the corner posts were driven in the ground, 2x6 framing was attached. Well, I know it's not pretty, but it is solid and you won't see it later when the skirting is on. Driving those stakes in the ground was hard work. It got pretty hot and I think I got a sunburn. Everything is level and ready for the plastic. 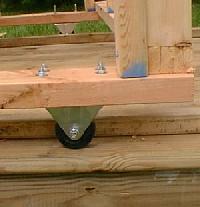 After the plastic was installed, then the joist were hung using those metal joist hanger brackets. Those sure make the job easier. 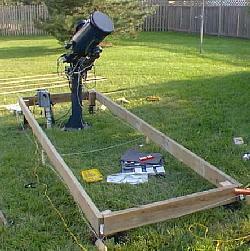 The decking was the easy part and was completed in time to do some observing that evening. Here is the final deck. I was surprised at how uneven the ground was. It took some special fitting of the decking around the pier and electrical and communications outlets. I used lots of duct tape to extend the pipe up and make it weatherproof. The second greatest invention of man is duct tape. The next day I framed in the house. It had to be just big enough to clear the telescope with a little room to spare in case I add anything later. Most of the studs used were 2x3's to cut down on some of the weight. I sure hope this thing isn't too heavy to roll on the little rubber wheels I bought. I will use three sets on each side to try to distribute the weight a little. 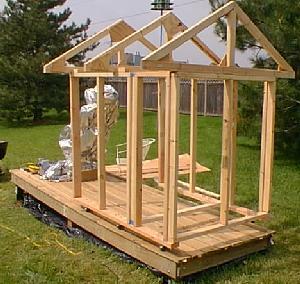 I guess I will put the wheels on next just to see how it works before I add the siding and roofing. All that extra weight and I might not be able to lift the house to put the wheels on. That would be a real problem. I may have to make a channel for the wheels to ride in and what to do about those 40 mile an hour winds we get here in Kansas? I can just see my house blowing away like in the Wizard of Oz. I need to find a way to tie this thing down, yet make it easy to release so I can roll it off when it is time to observe. Let me think about this one tonight. 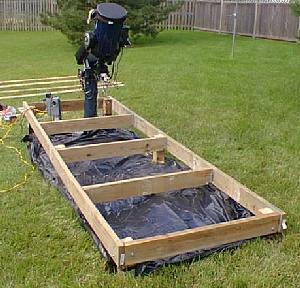 The wheels work great allowing the house to roll along the deck uncovering the telescope and allowing a clear view of all of the sky available. Here is a close up of the hard rubber wheel. 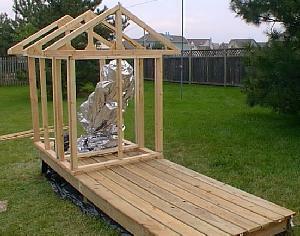 Next I put the siding and roof plywood on. The siding is intended to match the house. That's my control room next to the patio. With windows that look out to the observatory. Here is the control room. 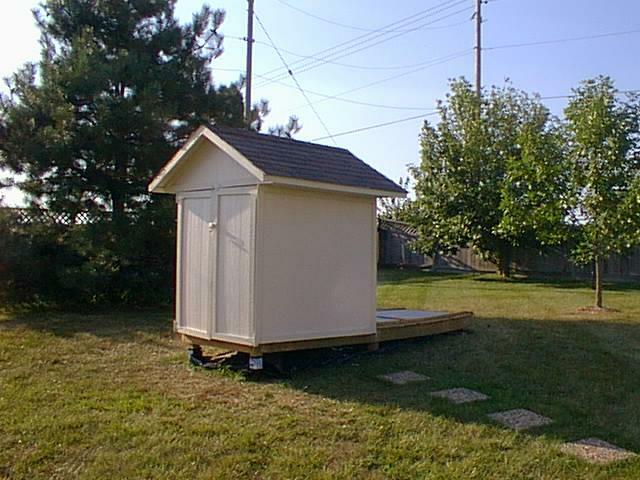 Roofed and painted to match the house, the Sunflower Observatory can now be locked up tight at night and provide a dry secure home for the telescope. The house rolls off when it is time to observe. The big dedication ceremony is planned for September 19 so that visitors in town for the Great Plains Star Party can come up and see it if they want to.